Over the years, the Police in Nigeria have earned themselves a very negative perception from the citizens. The institution has earned itself negative perception basically, through what people saw as its biased and partisan approach to issues of politics and its blind support to any government in power regardless of whether this government is right or wrong. This singular act made the force to be seen as an enemy by many a citizen in Nigeria instead of a friend, as the force preaches everyday. A careful study of the Nigeria Police Force, apart from the general negative perception most people have about the institution, the institution itself has contributed a lot in building a negative attitude it earned from Nigerians. First, there is widespread ignorance and misperception about the role and powers of the police, even within the ranks and file of the Nigeria Police Force on one hand and the general public on the other. This derives generally from the historical legacy of using police to suppress the citizens by colonial and post-colonial governments. Thus, citizens resent police, even when they are exercising their legitimate powers in the course of legally permissible law enforcement activities. That aside, the personality of the force itself does not speak well of an institution, instituted to safeguard and protect the lives and property of citizens. The hostile police-public relations contributed a lot to the present state of the police force. In many cases the police allowed themselves to be used by politicians, which in most cases put their top officers on their pay-roll, so as to look the other way, when they are doing their dirty job. In their bid to satisfy their pay masters, these corrupt officers sometimes forget their primary duty of protection of the rights of the citizens, sometimes even used obnoxious laws, to violate fundamental rights of citizens provided for in the constitution, on a simple pretext of maintaining peace and order. One is forced to make above assertion based on the event of July 11, 2009, in Kafanchan town in Kaduna state. On Saturday, July 11, 2009, the Movement for a Better Future, a civil society organisation with the objective of intervening in the social, economic and political life of the Nigerian society, organised a Public Lecture Kafanchan, Kaduna state. The Movement invited prominent Nigerians, politicians, scholars, professionals, civil society groups, religious and community leaders for a seminar to discuss on a burning issue 'Corruption and the Crisis of Development'. Those billed to present papers include Vicar General of the Kaduna Catholic Diocese, Rev. Fr. Mathew Hassan Kukah, Dr. Kayode Fayemi and Professor Sam Egwu. Unknown to the organisers, there are people, top officials of government, who don't like issues of corruption to be discussed. The organisers started receiving calls on their mobile phones and invitation from the SSS, and strong warnings on the pages of newspapers, particularly the New Nigerian, Friday, 10th July 2009, page 1-2, and New Nigerian on Sunday, July 12, 2009, page 36, where the Kaduna state police commissioner, Mallam Tambari Yabo Muhammad, issued a warning that they have reliably gathered that there are groups that hold, according to him, 'clandestine meetings'. This, he said, violated the provisions of the Public Order Act Cap 382 and the Penal Code of Northern Nigeria. The Saturday event left no one in doubt about the outcome of 2011 elections. It is also a pointer to the fact that still the Police have failed to learn from our ten years democratic experience. It is surprising that the institution regarde as one of the pillars of democracy could allow itself to be used by desperate politicians, who want to perpetuate themselves on power even if their people think otherwise. It is wrong and indeed very wrong for the police to allow themselves to be used in subverting people's will to organise themselves to chart a new course for the society which majority of Nigerians feel ia suffering from moral bankruptcy. No doubt there is popular frustration in Nigeria, emanating from what Nigerians are experiencing under the present dispensation for the past ten years, of misrule, total disregard for their basic rights as human beings, corruption, open stealing of public funds, election rigging, manipulation and abuse of democratic principles. Our politicians, it seems, are ready to go to any length, including ordering the police to shoot at sight, anybody who they feel can stand in their way to perpetuate themselves on power. If not, how can one answer the question of what the Area Commandant of Kafanchan Command alleged to have told the organisers when served with the notification of the Public Lecture that his men are going to shoot anyone who dare go to the Public Lecture. Is that what the law says? That law abiding citizens who organise themselves within the ambit of the constitution to discuss about how they want to be governed, to be threatened with shoot at sight order? The Movement for a Better Future is not a secret society. It is an interest group registered under the Ministry of Youth and Social Development with registration number KDS/YC/06/4773. It conducts its activities openly and does not hold 'clandestine meetings' as stated by the police authorities as the basis for stopping the public lecture. The constitutional provisions quoted by the police authorities to stop the public lecture have already been nullified by the Court of Appeal since December 2007 in the case of IGP vs ANPP (2007) 18 NWLR (PT. 1066). The provisions of the Public Order Act and the Penal Code of Northern Nigeria are also inconsistent with the provisions of the 1999 constitution, especially section 40. So it is clear Nigerians have constitutional rights to organize without any unlawful permit from anybody. Article 2 of the code of conduct for law enforcement officials adopted by the General Assembly of the United Nations, resolution34/169 of 17, December 1979, which is binding on Nigeria, stated that 'in the performance of their duty, law enforcement officials shall respect and protect human dignity and maintain and uphold the human rights of all persons'. 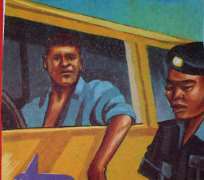 Today, forty years after the establishment of the Nigeria Police Force, we can rightly say, nothing much has change in the way the police work, from the way they were during the colonial period. Allegation and counter allegation in the way they perform their duty, especially during elections, their relationship with government in power has been a disappointment. As one of the pillars of democracy, the police in the last ten years have displayed highest sense of partiality, when what is needed from them was neutrality. The police in several occasions were accused of looking the other way when politicians rig election or clamp on opposition. In fact, there are instances where the police are accused of fully participating in the subjugation, suppression of the opposition or participating in rigging and manipulation of election results. For our democracy to survive, there is need for total re-orientation of the force to understand the role which the police are expected to play in a democracy. There is also a need for structural and institutional reforms, legislative initiatives as well as monitoring, research, and training and advocacy and mobilisation activities by civil society, in order to introduce and implement necessary changes within the police institution and in the relationship and partnership between the citizens and the police. These are necessary for the sustenance and survival of our democracy.